Save an extra 5% off* your order site-wide. Our FPF123016 Coupon Code is auto applied when you checkout. This Featured Product Friday (FPF) promo is valid from today, December 30, 2016 through Sunday, January 1, 2017 and the code is unlimited use. 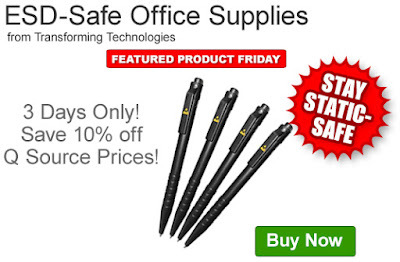 Save on thousands of items from top brands in a variety of types and applications. This is our way of wishing you a Happy New Year. Click here to shop, or for further questions about Featured Product Friday, please read our informational blog post, call us (800-966-6020), or send us an email. Please note: This promo is valid only at QSource.com and expires on January 1, 2017. The end of the week, month, and year is fast approaching. Why is that important? Well, if you like to save money on products you need, we have five, yes five, special savings promos expiring on 12/31/16. Visit the individual offer pages or our Current Promos page to shop now or for further information. You may also contact us via our Web site, phone (800-966-6020), or by email. Please note: These limited-time offers are only valid thru December 31, 2016. Leading off this week’s column: Do you have kids at home on holiday break? This Master Appliance post presents three fun heat gun art projects you can try with them. Fashion Seal HC’s post offers some revealing news for those in the healthcare industry: Over the past five years, a 21% decline in hospital-acquired conditions has led to $28 billion in savings. In another breakthrough for 3D printing and the medical industry, this 3D Printing Industry post tells about Chinese advances with testing 3D-printed blood vessels on living rhesus macaque monkeys. Here’s an interesting Laughing Squid post for those of you traveling during the holidays, a look at why airlines overbook. And we close out this week’s column with a post about our 2016 holiday schedule blog. Season’s greetings! We here at Q Source wanted to send our warmest wishes for Happy Holidays to you and your family. We thank you for being our loyal customers throughout 2016, and we look forward to serving you again in the New Year. Happy 2017! We’ll begin the New Year on Tuesday, January 3, 2017 with regular business hours. Please note: Our product-packed Web site, QSource.com, is available 24 hours a day, seven days a week for your orders or RFQ/inquiries. Orders submitted when our office is closed will be processed ASAP on the next business day we are open. 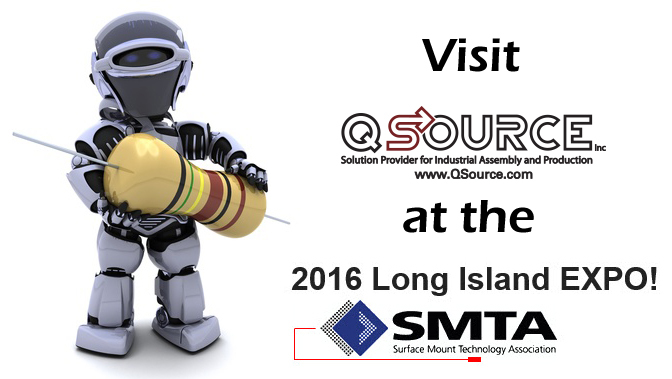 We also encourage you to visit our Q Source Resource Blog and follow us on our social media accounts. For questions and further information please call (800-966-6020), email us, or chat with us live at the Q Source Web site. Vision Engineering’s Autumn Lynx Evo Promo Ends 12/22/16 – Contact Us Today! Vision Engineering’s Autumn Lynx Evo promos end this Thursday. If you’re interested in a Lynx Evo or Evo Cam, find out how you can get a Free Smart Cam HD digital camera or a half price 360° Rotation Viewer with purchase. Offers expires 12/22/16. Contact us at 800-966-6020, via email, or via our Contact Us page. Leading off this week’s column: If you’re going to be on the road a lot this holiday season, make sure to read Workrite Ergonomics’ post about the dangers of sleepy driving. Does your company need a creative boost? 3M’s post offers up scientists’ tips for fostering a culture of innovation. Agilent Technologies’ post examines the mystery of Nefertari’s knees. Learn about recently discovered, and newly named, elements like nihonium in the National Nuclear Security Administration’s informative post. EEVblog’s Dave Jones presents a fun teardown video about the world’s first portable computer, the Osborne 1 from Osborne Computer Corporation. 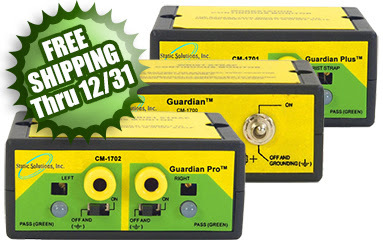 And we close out this week’s column with a post about our newest promotion, Free Shipping on Static Solutions Guardian Constant ESD Monitors. Save an extra 10% off the Q Source price of the Eclipse Student's Basic Tool Kit. Our FPF121616 Coupon Code is auto applied when you add the eligible tool kit to your shopping cart. This Featured Product Friday (FPF) promo is valid from today, December 16, 2016 through Sunday, December 18, 2016 and the code is unlimited use. 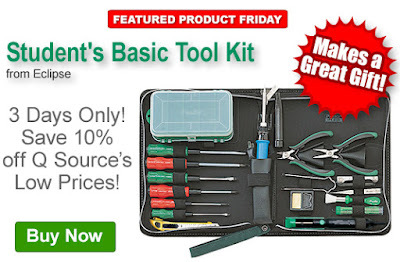 This basic tool kit from Eclipse is perfect for technical students who are starting out in the electronics field. Provides various tools for multiple applications in a convenient carrying case. Click here to shop or, for further questions about Featured Product Friday, please read our informational blog post, call us (800-966-6020), or send us an email. Please note: This promo is valid only at QSource.com and expires on December 18, 2016. 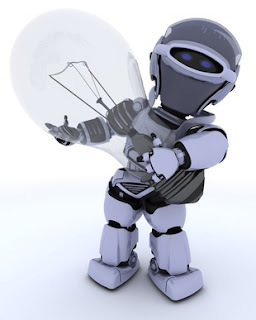 Leading off this week’s column: We have this “enlightening” post shared by JBC Soldering that says the future of electronics is light, in the form of photon-based transistors. For those who work in controlled environments, head-to-toe contamination protection is vital. Valutek’s post examines one end of that spectrum by looking at the difference between plastic and polypropylene shoe covers. TE Connectivity’s post travels down the fast lane to the future of mass transportation. Wonder what an Airy Disc is? How about the Rayleigh Criterion? Is microscope resolution important to you? Then you need to check out Leica Microsystems’ informative post. The Empire State Building was once the world’s tallest building. Puritan’s post shows how toothpick artist, Steven J. Backman, turned that icon into the world’s smallest toothpick sculpture. 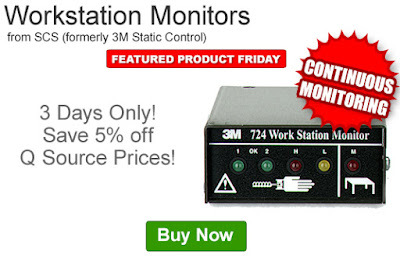 And we close out this week’s column with a post about our limited-time Free Shipping offer on select ESD Constant Monitors. 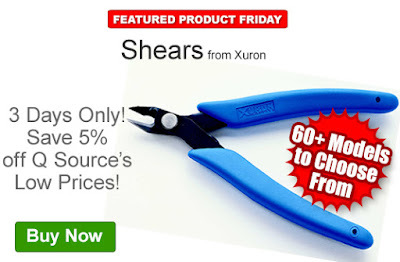 Save an extra 5% off the Q Source price of Xuron Shears. Our FPF120916 Coupon Code is auto applied when you add an eligible pair of shears to your shopping cart. This Featured Product Friday (FPF) promo is valid from today, December 9, 2016 through Sunday, December 11, 2016 and the code is unlimited use. These shears (more than 60) are available in a number of styles and sizes from Xuron’s 9000, LX, Maxi-Shear, and Micro-Shear Series. See our Web site for further specifications. Click here to shop or, for further questions about Featured Product Friday, please read our informational blog post, call us (800-966-6020), or send us an email. 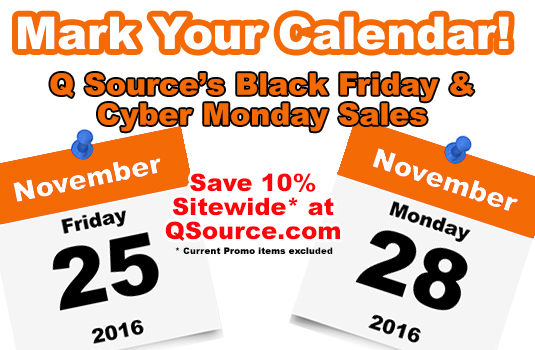 Please note: This promo is valid only at QSource.com and expires on December 11, 2016. 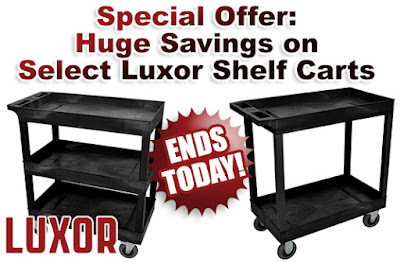 Our special savings offer on select Luxor Shelf Carts ends today! Don’t miss your chance to save up to 47% off these versatile, durable carts. Purchase your carts at our Luxor promo page, TODAY. You may also contact us via our Web site, phone (800-966-6020), or by email. Please note: This limited-time offer is only valid thru 12/5/16. Save an extra 10% off the Q Source price of Production Basics 4-Leg Workbenches. Our FPF120216 Coupon Code is auto applied when you add an eligible workbench to your shopping cart. This Featured Product Friday (FPF) promo is valid from today, December 2, 2016 through Sunday, December 4, 2016 and the code is unlimited use. 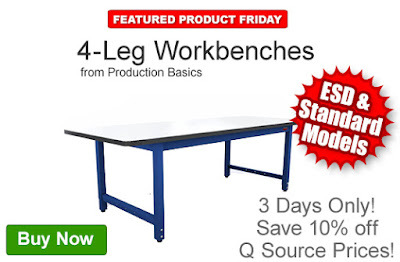 These 4-leg workbenches are basic, but versatile, and can be customized to meet your needs. Promo-eligible benches include both standard and ESD models. Click here to shop, or for further questions about Featured Product Friday, please read our informational blog post, call us (800-966-6020), or send us an email. Please note: This promo is valid only at QSource.com and expires on December 4, 2016. Leading off this week’s column: We start with a birth. Check out this cool microscopic look, shared by ACL Staticide, at the process of a crystal being born. Driver-less cars are one thing, but driver-less race cars?! TE Connectivity’s post presents an electric race car that doesn’t need a driver. Puritan’s post examines an amazing study that shows only half of a chromosome is DNA. A new study, shared by 3D Printing Industry, states that while consumers believe 3D-printed products have a higher perceived value, they were not ready to pay the extra cost for a 3D-printed object. Laughing Squid’s post reveals that scientists are using metamaterials to create an invisibility cloak. And we close out this week’s column with a blog post about our new Web chat option, which offers live customer service. Click here to head to our Web site and save 10% on your order*. Cyber Monday is underway! 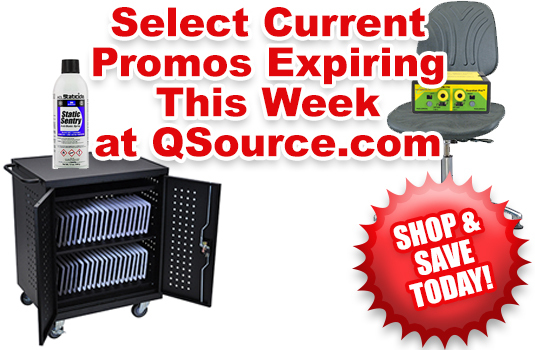 Cyber Monday savings exclude Current Promo items, but are valid on thousands of other items at QSource.com. That equals an extra 10% off our regular low prices. Eligible items cover a variety of products for industry, crafts & hobbies, and every day usage. You’ll save on hand tools, LED lights, chairs, vacuums & cleaning products, and many, many other popular items from top-name manufacturers. 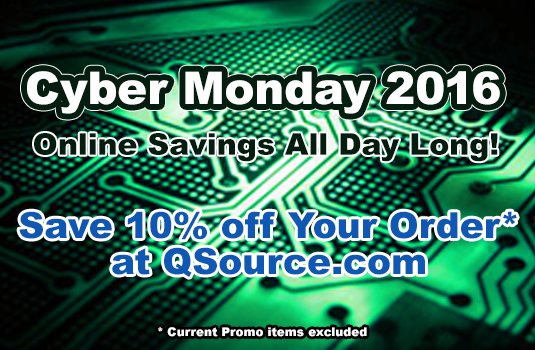 Visit QSource.com today to get 10% off your order. You may also contact us via our Web site, phone (800-966-6020), or by email. Our annual Black Friday sale is underway. Visit our Web site today to get an extra 10% off your entire order. Black Friday savings are site-wide (Current Promo items excluded). That equals an extra 10% off our regular low prices on thousands of items at QSource.com. Choose from variety of products for industrial needs, hobbies & crafts, and daily usage. Save on hand tools, LED lights, chairs & stools, vacuums, and many, many other quality items from dozens of leading manufacturers. 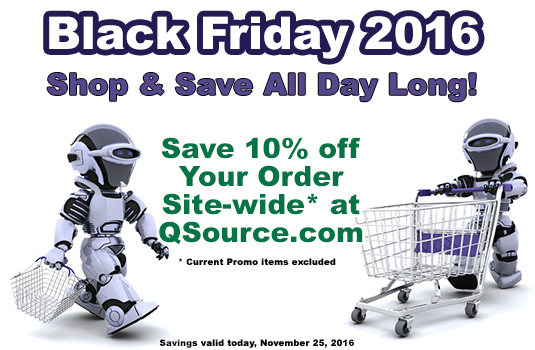 Stop by QSource.com today to get 10% off your order. You may also contact us via our Web site, phone (800-966-6020), or by email. Tomorrow is Thanksgiving. But we’re thankful for our valued customers every day. 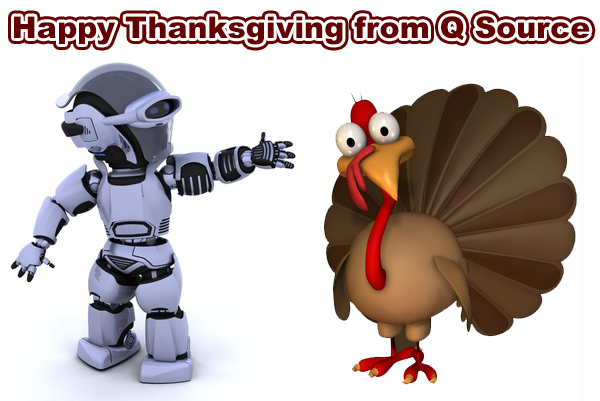 Our Q Source family would like to take this time to wish your family a very Happy Thanksgiving and to say thank you for your patronage over the years. So our family can fully enjoy the holiday, our office will be closed on Thanksgiving Day (November 24, 2016) and on Friday, November 25th. We will re-open the office for regular business on Monday, November 28th. 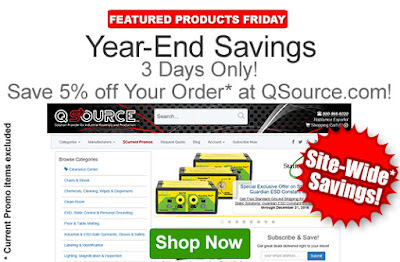 QSource.com will be available for your orders during our holiday closing (and is always accessible 24 hours a day, seven days a week). Orders placed over the closure will be processed ASAP and you will be notified via email upon completion. Our office can also be contacted via email, phone (800-966-6020), and Web chat with immediate responses during regular business hours. 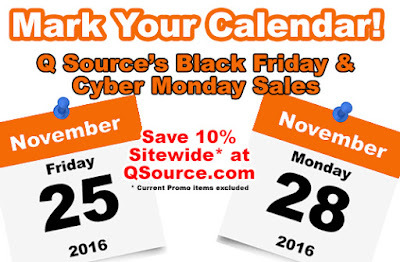 If you are shopping online this Friday, please look out for our Black Friday sale or visit us on Monday for this year’s Cyber Monday savings at QSource.com. 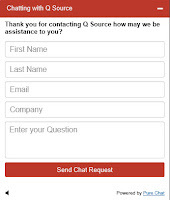 We’re excited to announce that QSource.com now offers Web chat with a live human (sorry, Q-Bot). We believe you’ll find this option helpful, as we strive to make your shopping experience easier and more satisfying. Chat is available during our regular business hours between 8:30 a.m. and 5:30 a.m. Eastern (an email option is provided after that). 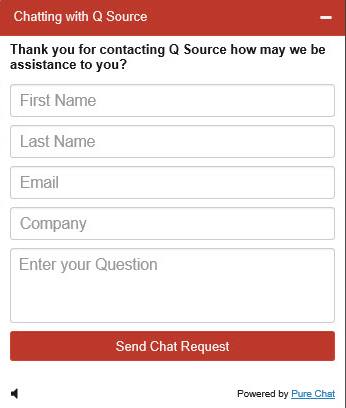 The chat option is now available throughout QSource.com. Once you’re on our Web site, just click on the Q logo with the phrase “Chat with Us!” You’ll then be presented with a form to fill out with your question and some basic info. After you click “Send Chat Request,” one of our customer support specialists will respond to your request and the chat will begin. Our expert staff will answer your questions and assist you with the checkout process. When the chat is complete, you’ll have an option to download the chat transcript and also to rate your chat experience (which we very much appreciate, as it helps us learn to help you better). We hope you’ll utilize this new chat option when you require additional information or assistance with completing your order. Customer satisfaction has been our goal since 1984 and we believe this new way to communicate will allow us to reach that goal. You may also contact us via our Contact Us page, phone (800-966-6020), or by email. Our annual Black Friday and Cyber Monday sales are coming next week. Stop by our Web site on Friday, November 25th and Monday, November 28th to get an extra 10% off your entire order. We didn’t want to just pick one or two items to offer you savings on, so we’re giving you 10% off when you order site-wide (Current Promo items excluded). That’s an extra 10% off our already low prices on thousands of items at QSource.com. We offer a large variety of products for industrial applications, hobbies, crafting, everyday use, and more. Our Black Friday/Cyber Monday sales are a great chance to save on hand tools, LED lights, chairs & stools, vacuums, and many, many other quality items from leading manufacturers. So, stop by QSource.com on Friday the 25th and Monday the 28th and get 10% off your order. You may also contact us via our Web site, phone (800-966-6020), or by email. 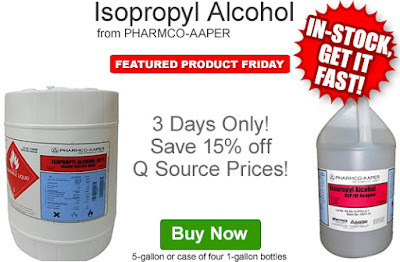 Save an extra 15% off the Q Source price of our in-stock PHARMCO-AAPER Isopropyl Alcohol. Our FPF111816 Coupon Code is auto applied when you add an eligible isopropyl alcohol product to your shopping cart. This Featured Product Friday (FPF) promo is valid from today, November 18, 2016 through Sunday, November 20, 2016 and the code is unlimited use. Featured Product Friday savings are offered on the 5-gallon or case of four 1-gallon bottles. MSDS and technical data sheets for each eligible PHARMCO-AAPER Isopropyl Alcohol item are available on our individual product pages. Click here to shop, or for further questions about Featured Product Friday, please read our informational blog post, call us (800-966-6020), or send us an email. Please note: This promo is valid only at QSource.com and expires on November 20, 2016. Our recent Bevco Dura & Everlast 7-Day Quick-Ship promo was very popular. With that in mind, we’ve decided to continue it thru the end of the year AND we’re now offering Free Standard Ground Shipping* on promo-eligible chairs. What’s better than getting your chairs fast? No shipping fees! Running through December 31, 2016, you’ll get eligible Bevco Dura and Everlast Series Chairs in seven days…and the shipping is on us. This is a limited-time offer on high-quality chairs that offer ergonomic comfort and durable reliability. These Dura/Everlast chairs feature polyurethane seats, resist stains and damages, offer increased air circulation, and meet stands like ANSI/BIFMA & California 117. Bevco chairs are very customizable; please see each chairs product page for specific features and customization options. 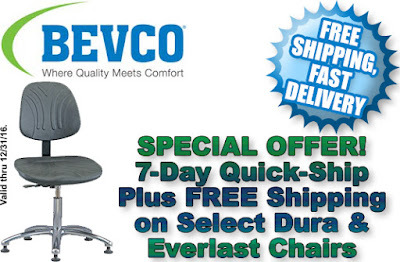 Visit our Bevco 7-Day Quick-Ship/Free Shipping promo page today to purchase your Dura or Everlast products. You may also contact us via our Web site, phone (800-966-6020), or by email. * Additional services may require a fee. Leading off this week’s column: We start with a heart-warming post by Weller about volunteers in North Carolina’s Triangle area coming together to “hack” hundreds of toys for children with disabilities. Have you ever heard of Touch DNA? Puritan’s post tells us about this new CSI technique that can reveal usable information from just 5 to 30 skin cells. This 3D Printing Industry post examines the exciting combination of super-fast lasers and 3D printing for the future of medicine, particularly with stem cell research. Scientists and engineers apply technology to many modern-day problems, such as traffic and slow-moving roads. TE Connectivity’s post checks out how technology is being used to create a faster, safer future for mass transportation and commercial transit. Helllooooo, is anybody there??? Laughing Squid’s interesting post offers up a map of the many areas in the United States where the population is zero. And we close out this week’s column with our blog post about a special offer: Buy 3 Eligible ACL Staticide Products, Get 1 Free. 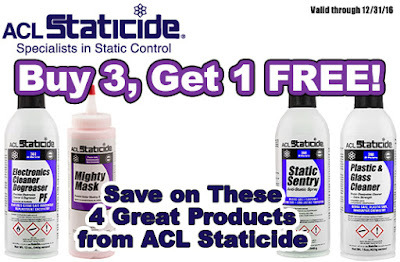 Here’s an awesome opportunity to save on anti-static aerosols, cleaners, and soldering masks from ACL Staticide. Our Buy 3, Get 1 Free sale applies to four great ACL products and is valid thru the end of 2016. ACL Staticide’s 2006 Static Sentry 12-oz. Can - A topical ozone-safe humidity independent aerosol used for instantly eliminating charge generation on both porous and non-porous materials and inhibiting tribogeneration. The 2006 meets MIL-B-81705, Federal Test Standard 101 and has a formula that does not contain substances on the REACH SvHC list or in the RoHS Directive 2002/95/EC. ACL Staticide’s 8601 Electronics Cleaner Degreaser PF 12-oz. Can - An ozone-safe, extra-strength universal cleaner and degreaser that leaves no residue and is safe to use on plastics. The 8601 removes oils and hydraulic fluids from mechanical assemblies, cleans handling soils from circuitry before reassembly, removes grease from assembly lines, and even cleans fiber-optic connectors. ACL Staticide’s 8670 Plastic & Glass Cleaner 15-oz. Can - An ozone-safe foaming, non-streaking, static neutralizing cleaner used for transparent surfaces. The 8670 cleaner controls static while cleaning, polishing, and effectively removing handling oils, finger soils, nicotine stains, and preventing dust attraction. ACL Staticide’s 8691 Mighty Mask 8-oz. Bottle - A fast-curing, temporary soldering mask designed for a wide range of electronic manufacturing applications. The 8691 is a quick-drying plastic-safe mask that peels off easily by hand, or with tweezers, without leaving contaminating or corrosive residues. It has a special heat-resistant compound that provides short-term protection up to 510°F and is compatible with all cleaning solvents and flux types, is RoHS compliant, and made in the USA. ACL, Inc. develops innovative static-elimination products. Their Staticide® products provide reliable, cost-effective static protection. Visit our ACL Buy 3, Get 1 Free promo page today to purchase your ACL Staticide products. You may also contact us via our Web site, phone (800-966-6020), or by email. Leading off this week’s column: Look at the walls of your workplace…are the colors inspiring? Workrite Ergonomics' post reveals the three ways color can be a secret weapon for creativity in the workplace. Speaking of inspiration, this 3M post looks at how a 13-year-old girl was inspired to invent a new type of renewable energy gadget by watching tree branches swaying in the wind. Agilent Technologies’ post offers hope for a new alternative to chemotherapy with the news that an immunotherapy drug has been approved by the FDA for use in previously untreated lung cancer patients. Have you ever heard of “valleytronics?” Tektronix’ post offers news of a 20-year-old, now-proven theory, for manipulating charged particles for use in more efficient electronics devices. Ever wonder how PCBs are manufactured? Dave from the EEVblog shows us the process in this fun video. And we close out this week’s column with our newsletter about the November updates to QSource.com’s Current Promos page. QSource.com is back online and the Q Source office will be open on Monday morning for regular business hours. We suffered a major power outage yesterday, which took the entire day for local crews to repair. We are happy to report that all is back to normal as of early this morning. We thank you for your patience during this unexpected downtime. If you attempted to place an order at QSource.com during the period when we were offline, please try now and your order will be processed ASAP on Monday morning. Please note: Q Source is currently experiencing a power outage at our Bohemia, NY office. QSource.com is currently down. Our phone lines are also down. We will post again when we are back up, which should be very soon. Leading off this week’s column: Puritan’s post brings to light a major challenge facing criminologists, staged crime scenes. Have you seen the term RoHS and wonder what it is? JBC Tools’ post provides insight as to why this legislation is so important. Hacking is at the front of the news lately. This National Nuclear Security Administration post offers tips to create a culture of cybersecurity for your organization. Made in Space (MIS) sent the first 3D printer to the International Space Station and it has been successfully used to create various parts. This 3D Printing Industry post reveals that MIS is now using the space environment to create high-quality ZBLAN fiber optics, which offer lower transmission losses than those made on Earth. There are millions of colors visible to the human eye, but not everyone sees them as they are. This Laughing Squid post presents a visual look at how color blind people see the world. And we close out this week’s column with our post about Q Material Handling. Leading off this week’s column: Can computers diagnose cancer in humans? Fashion Seal HC’s post tells about how IBM’s supercomputer, Watson, has a 90% success rate doing just that. Jergens post comes with a sense of urgency for the manufacturing industry: An estimated 2 million jobs, in that sector, will go unfilled if more youth don’t pursue a STEM education. How do you feel about the current adult coloring book fad? Workrite Ergonomics’ post looks at the stress relieving aspects of coloring for grown-ups. Another post with an urgent message, Agilent Technologies presents a World Health Organization report that 92% of the world now breathes polluted air. Is it language or a valid concern? EE Times’ post examines Germany’s efforts to block Tesla from using the terms “autopilot,” “self-driving,” and “automated” in their automobile advertising. And we close out this week’s column with our blog announcing our exhibit at the 2016 Long Island SMTA Expo and Technical Forum. 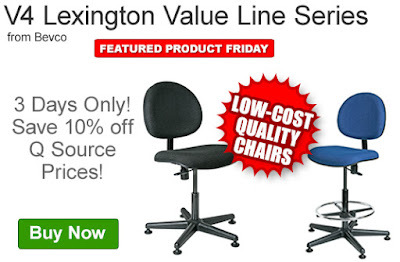 Save an extra 10% off the Q Source Price of Bevco’s Lexington V4 Series Value-Line Chairs. Our FPF102116 Coupon Code is auto applied when you add an eligible chair to your shopping cart. This Featured Product Friday (FPF) promo is valid from today, October 21, 2016 through Sunday, October 23, 2016 and the code is unlimited use. These Lexington V4 Series upholstered chairs offer quality at a low cost. Easy to assemble, Bevco’s V4 line complies with ANSI/BIFMA X5.1 standards. Click here to shop, or for further questions about Featured Product Friday, please read our informational blog post, call us (800-966-6020), or send us an email. Please note: This promo is valid only at QSource.com and expires on October 23, 2016.